Life is the best teacher, or as my high school chemistry teacher used to say he learned some great lessons in Corncob U. He learned he should get back to school and earn a degree. Life lessons may be the best lessons, but life experiences are not always pleasant or efficient ways to learn. I have managed to determine if the grill is hot without touching it. To the scoffers reading along yes, after years of burnt fingers. Sometimes an event can teach lessons not intended and have an impact beyond the confines of its location. I think such an event occurred last Saturday afternoon. When the Stark County Rebels headed to Altgeld Park in Chicago to play Chicago Hope Academy in the IHSA playoffs. I had just been at a Stark County game where the emotions of the game got rather intense. I feared there could be some ugly comments. A couple of years ago my son's team had a playoff game in an Eastern Illinois community. 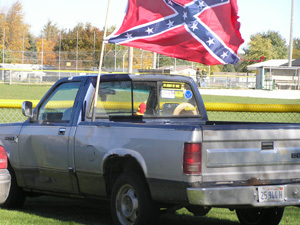 I took this picture of a "redneck ride" parked beside us. They were the Storm, not the Rebels. I love history especially the Civil War, but flags like this make modern political statements. It was probably just a couple of misguided youth, rebels to authority, but who knows. We encounter people with such divergent world views; sometimes we seem not to be living in the same land or time. The game was at Altgeld Park which is named for Gov. John Peter Altgeld considered a profile in courage for pardoning workers after the Haymarket Riot. I can't pass up a history lesson. I had zoomed Google maps to Altgeld Park and didn't see a football field and commented it was like going to a JFL game. After reading the posts on the message boards, I learned sometimes you need to have more faith in people. It was this post that inspired me to create an additional essay for the site. It was posted by "Two Long" on a Peoria message board. The field was just like any JFL field in a park you have seen. There were bleachers down one side, and the Stark County fans filled most of them. There were goal posts. they looked kinda make-shift though. The entire field was surounded by a fence. The Crows nest was scaffolding with two levels. The WJRE radio station announcers were on the first level, and a couple of coaches were on the next level. They had to climb the side of the scaffolding to get to the top. The announcer for the game stood on a step ladder throughout the entire game. Did a pretty good job though, which is more than I can say for Kevin, the guy running the scorboard and clock, who was roaming the sidelines. The announcer had to keep yelling at him to start the clock, and then take some time off the clock to correct his mistake. Once inside the park, it seemed safe, but the drive down the street to get there, took you past the Harrison Street public housing complex, and a homeless mission where both sides of the streets were lined with homeless folks. The sad thing, is that, this is a street that many of the students at Chicago Hope have to walk down everyday to get to school. The bathrooms were located in the basement of a gym next door to the park, and there was no water, so the toilets would not flush. I am told they did get water turned on later. When facing the goal posts on one side of the field, you could see the Chicago skyline, and when field goals were kicked in that direction the football landed on the train tracks, a little boy would climb the large fence to go and retreave the ball from the tracks. The hill just behind those goal posts, we were told, used to be called "crack hill" bcause it was a very large place for crack sales. The school bulldozed and bricked it on one side and named it Hope Hill. Along one side of the field the Chicago Metra L train ran past, and behind it we heard some gunshots and saw police respond a bit later. I am not making this up, and my description cannot really do justice to where we really were on Saturday night. I'm not sure anyone was really prepared for this experience. BUT, I have to say this, this school and it's representatives were the nicest we have ever encountered. They made sure the team had everything they neded. The sportsmanship we saw on the field was incredible, and the players said the Hope players were so sincere afterward in wishing the SC players well. The people taking tickets thanked us all for coming and wished us much luck. This experience was unlike anything most of us have ever seen, and one I'm sure we won't soon forget. Sometimes an event can teach lessons not intended and have an impact beyond the confines of its location. The magic evaporated like frost in the morning sun at Champaign. The Trojans of Triopia had waited thirty three years and used a powerful running attack to knock cinderella to the sidelines. SC caused it's own problems with penalties, but could not contain the offensive line and determined running of Triopia. The Rebels stayed tough but the 22 to 0 halftime score was enough, the Trojans went to 42 before the Rebels made their lone score. The 2008 season will be a memorable one for Stark County. I think many will remember how a team found the special character to put team first, then to play hard on every down, as much as a trip to Champaign.